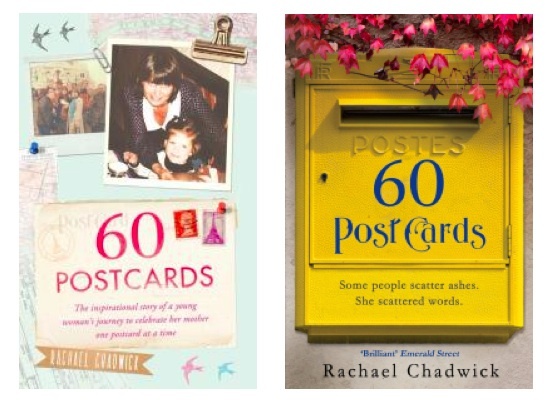 I have been fortunate enough to tell my story through a book; an honest narrative following the journey of my grief, the magic of the postcards and events in between. Copies are currently a wee bit limited but you can grab a paperback here or a hardback here. My son Gareth worked with you and had told me about your 60 postcards project, what a really lovely idea. He gave me your book for Mother’s Day in 2014, I was delighted but could not bring myself to read it. My sister was very ill with cancer and sadly died later that year. It has been sitting on my bookshelf for two and a half years and I have now plucked up the courage to read it. I cried a lot over the first few chapters but also smiled a lot over your antics in Paris, the responses to the postcards making me cry again. I would love to find one of your postcards, it must have been so exciting for the people who found them. It really is a fantastic project, the blog is amazing and you have inspired and helped so many people. I just wanted to say Thank You. Hi Sandra. Thanks so much for your lovely message. So sad to hear about your sister. I can completely understand why you waited to read. Sending lots of love. And thank you for reminding me that I must catch up with Gareth soon. He’s a gem :). I’m not sure if you are used to receiving messages from 17 year old Australians (although I like to think of myself as an old soul) so I thought that I would let you know that your mother’s tribute has hit Australia! I am hoping to study psychology next year and while I was perusing this section in a city library (somewhere I hadn’t been before) I stumbled across your book and was immediately captivated by your story. When I was in fifth grade (so 10 – yes, I was still young) one of my best friends was diagnosed with leukemia and immediately flown to Brisbane for treatment, where she stay on and off for two years. She had bone marrow transplants, chemo therapy and the support of a whole town. She was a fighter. But she didn’t make it. In your book, as i have heard before, you said that the one’s we love wait until we are not around to witness their passing. She did this too, I feel, and it only reminds me how strong she was throughout the whole process! Two years of her life and she only cried twice. And for a ten year old girl, I think that this is pretty astounding – she cried only when finding out, and when being reunited with all her friends. She was a beautiful girl, and lives on in all of our memories. I can honestly say that there is not one day that I don’t think of my friend, and though five years have now passed, there can be moments when I completely lose myself in grief for her. But I get stronger with each of these moments. I am sure that your mother would be very proud, and I hope your family are well (strange, how after reading your book, I feel as though I actually know them). I don’t know how these books keep falling in my lap but they do and I read them crying my eyes out at times but always feeling better after. Thank you for making me feel less alone in my nutty thoughts. I have just started reading your book, which I have borrowed from the library, and already I am moved to tears. It is a wonderfully inspiring book and I am using a postcard with a rainbow over the beautiful Somerset countryside which I will be sending to my best friend, currently in Nepal on assignment. I look forward to seeing the book in paperback, which I will certainly buy! Hi, our Mum recently borrowed your book from a friend. Would it be possible for us to buy a signed copy for her? Your story and your words have meant more than I can say over the last two weeks as I have read and cried through your book. You are so down to earth and I think your project has undoubtedly made – and continues to make – such significant advances in the realm of ‘being allowed’ to talk about death. You are truly (madly, deeply) an inspiration for us all. I am 31 and my own mum died about 10 weeks ago, after she was diagnosed 18 months ago with “treatable but not curable” secondary breast cancer. Although my family and I had much more than the 16 days you had to try to begin coming to terms with mum never being here again, it was still a devastating shock when she died, one that I am still far from finding words to express. My family and I are seeming to have such different responses to grief that I have been feeling so unbelievably alone. Your book made me feel like I had a friend who understood. Your humble and truthful telling of your story is overwhelming for being just that. I know that your blog and your career as a writer have taken off in an amazing way, but if you ever still contact those who comment on your blog, I would love to be in touch! If not, I hope you read this, along with the words from so many many others you have touched, and keep feeling inspired and inspirational.